The baseline survey of engineering departments of Kenyan universities was part of the e-readiness survey of universities research series. Engineering baseline survey was carried out in 12 universities which were offering engineering courses. The baseline survey was part of the preparation to a comprehensive e readiness survey of engineering departments in Kenya. However, baseline surveys of ICT departments and medical schools are yet to be released. Cabinet Secretary for Education, Science and Technology Dr. Fred Matiang'i(left) accompanied by Prof. Meoli Kashorda, Executive Director of Kenya Education Network(KENET) and Prof. Timothy Waema(centre), Chairman KENET Management Board during the launch. KENET launched the 2015 Baseline Survey of Engineering Departments Report on 8th March, 2016 at the Intercontinental Hotel, Nairobi. 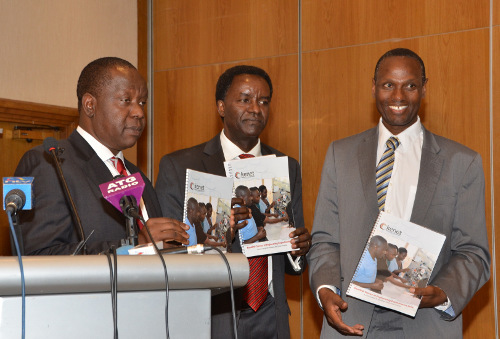 The launch was officiated by Dr. Fred Matiang’i, Cabinet Secretary, Ministry of Education Science and Technology. Engineering baseline survey questionnaires were designed and sent to KENET research assistants who were either faculty members or senior network administrators in the university. Research assistants were given introduction letters which authorized them to collect data, these letters were given after the survey had been authorized by the Vice Chancellors of the respective universities. The first engineering education forum was organized by KENET on October 30, 2015 at Safari Park Hotel Nairobi, what an opportunity for engineering department’s heads to share their views on engineering sector. As always, KENET offer full board and accommodation to participants coming from universities outside Nairobi, a night before and after the forum. One week after the forum, engineering baseline survey questionnaires were sent directly to heads of department’s through courier. This was followed by a phone call to the engineering research assistants whose duty was to help follow up with the department to ensure that the questionnaires were filled. Undergraduate enrollment trends showed positive yearly growth in all the categories of engineering departments ( Electric and Electronic, Civil and Structural, and Mechanical Engineering),with an overall growth of 28.7% in AY 2013/2014 and 94.2% growth in AY 2014/2015. This growth would explain the competitiveness of engineering courses and education in Kenya today.